Das Wetter wird kühler aber es ist immer noch nicht zu spät für ein paar warme Tage. Ich finde Pflaumenkuchen drückt genau das aus. Pflaumen sind sowohl eine Sommer- als auch eine Herbstfrucht. Man pflückt sie vom Baum, wenn einem die Sonne noch gerade so auf den Kopf brennt. Wenn man dann den Kuchen in den Ofen schiebt, regnet es aber vielleicht schon und man freut sich nicht nur über einen tollen Nachtisch, sondern auch über eine warme Küche. 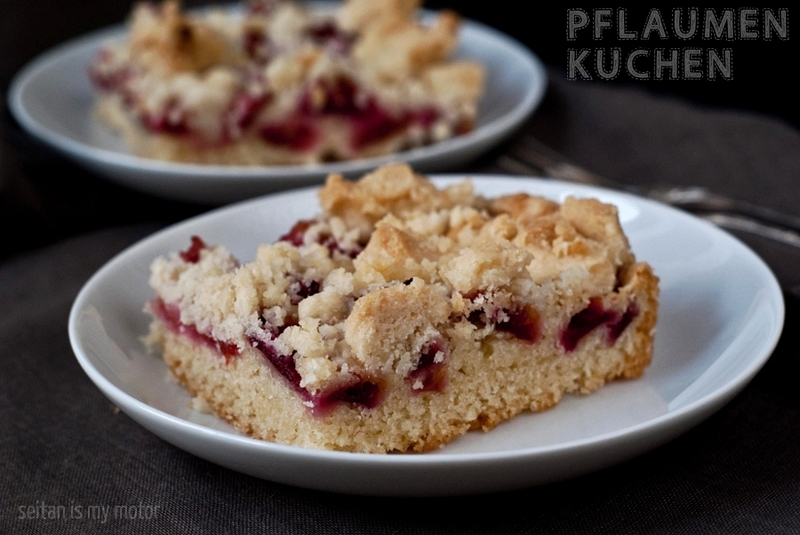 Vor vier Jahren habe ich ein Rezept für Pflaumenkuchen mit Hefeteig veröffentlicht. Heute soll es etwas schneller gehen. Ich habe mich für eine Kombination aus süßem, lockeren Kuchenteig und buttrigen Streuseln entschieden. Sehr lecker und schnell gemacht. Ofen auf 200°C vorheizen. Eine rechteckige Kuchenform (18 x 28 cm) einfetten und zur Seite stellen. Mehl, Kichererbsenmehl, Backpulver und Zucker in einer Schüssel mischen. Sojamilch und Öl dazugeben un alles zu einem glatten Teig verrühren. In die Form geben. Die halbierten Pflaumen mit der angeschnittenen Seite nach oben und möglichst dicht aneinander auf den Teig legen. Alle Zutaten für die Streusel in eine Schüssel geben. Zu einem Teig verkneten und dabei das Kokosfett gut einarbeiten. Zu Streuseln formen und auf dem Kuchen verteilen. 15 Minuten bei 200°C backen. Dann die Temperatur auf 160°C senken und weitere 35 bis 40 Minuten backen. Abkühlen lassen und servieren. Diesen Kuchen kann man auch sehr gut einfrieren. Thank you so much for this recipe and for your blog! I moved to Dresden from the US last year with my German husband and on top of the typical challenges associated with such a move, I’ve also been making the transition to a vegan diet (probably not smart to wait until moving to Germany, but better late than never and I have more free time now to cook than ever before!). I made this last weekend and it was a total hit with my husband! Next up: käsespätzle! Thank you for your wonderful comment, Christine! That’s nice to hear. OK I am about to make this for the third time in 2 weeks. Sooooo many plums! I recently became vegan and am going to try this, except I am going to use white meat peaches.. I have this in the oven right now. Thanks for including the cups/spoons measurements! It smells fantastic. Thanks also for helping me use some of the plums off my tree! I will be making this ASAP for my Austrian-raised husband….he will be AMPED! Awesome! Please let me know how it turned out, if you like. These are gorgeous!! Your recipes are so simple, yet the desserts are so elegant. I am totally gonna bookmark this for later. What other fruits in addition to plum do you think would work well? Apples and pears come to my mind. Cherries would work, too. Beautiful! 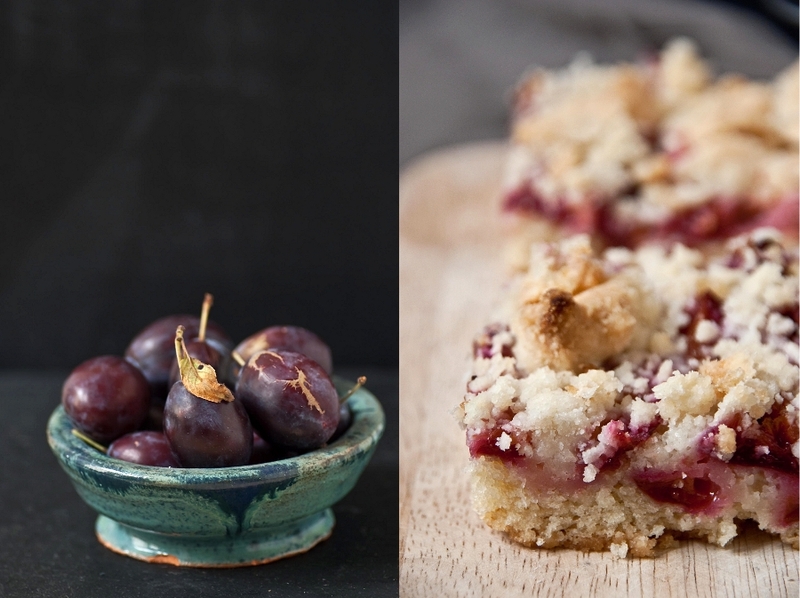 I can’t remember the last time I baked with plums so I am bookmarking this for later use! Those deep purple Italian Plums are so delicious! I used to eat them by the bucketful as a kid, along with supersweet Santa Rosas. Thank you for the recipe! Yes and yum! I’m so glad to see this recipe veganized–and doubly happy that it doesn’t contain margarine/vegan butter! This looks like a good dessert to bring to potlucks this fall. Desserts with plums on a cold day = comforting cake heaven. This is just the sort of thing I want to be eating now the cold weather’s kicking in over here. Alright, who am I kidding – this is just the sort of thing I want to be eating every day! Look at the gorgeous streusel on top! It takes some convincing for me to make a cake that isn’t chocolate, but this I will make in a heartbeat! It looks so good, perfect with a cup of tea in the sunshine. Yes, I will have to try this dough. My son loves these prune plums, He was hoping we would get to pick some, but bought some instead. Brings back happy memories! Another winner, Mihl! The crumb on this cake looks so good, and I’m not even a cake person. Ooo, I just picked up a bunch of those prune plums (I think they call them French plums at the farmers market???) with no idea what to do with them. So pretty! Yowzer, this looks amazing! The plums are great here too at the moment. So juicy and delicious! So pretty! Plums are just perfect at this time of year. I’d love to try making a cake with yeast too. I think I’ll check out that version since I prefer my baked goods on the less sweet side. That looks really good! I’m trying to find recipes using plums that I like, because I don’t like eating plums! So I definitely want to try this! Gorgeous! I love plums, but have never gotten around to baking with them. This cake is just beautiful.